Every week MOMS receives several emails from companies trying to get us to promote their wares. Normally, it’s apps or fantasy football. This week though, we received a couple of things from EA Sports and Sports Direct, that might be of interest to at least some Villa fans. EA Sports sent us a video of the FIFA 15 Pro Player Tournament between Christian Benteke and Andreas Weimann vs Gabriel Agbonlahor and Darren Bent, below is the video to what happened in their best of three face off. Look at the stat cards of the four Villa players involved. If only, they were that good, Villa would probably would have scored four or five times the amount of goals this season. Also, the video is worth a watch for Benteke’s fashion statement. What is he wearing?! Sports Direct had an infographic of the geographical top 10 breakdown of their shirt sales, which some press seem to have run as the gospel of various club shirt sales. Of course, you have to remember, it’s just Sports Direct sales. Also, you have to remember that most shirts in Birmingham would be sold through the club shops and other sporting outlets in the city centre. 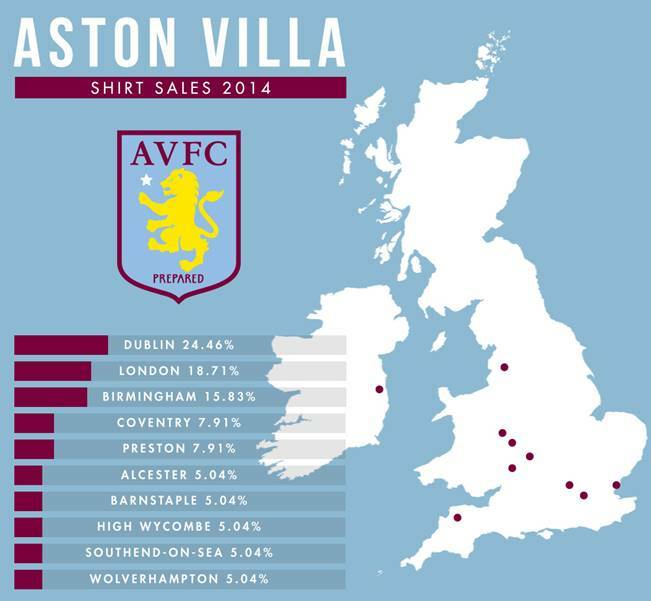 They do back up the fact that Villa have a keen following in Ireland though.